Add your name to the Waiting List below! This little Victorian brick structure makes a fine on-line industry for your pike. Tom Yorke originally used this structure as a milk collection station (a/k/a The Milk Depot). Local dairy farmers would bring in their milk during the wee hours of the morning. The collected milk would then go by rail to a creamery many miles away. Weather this kit is used for this purpose or for another type of co-op, etc., you may agree that it does build into a charming little structure. This *original* Thomas A. Yorke kit (now Scale Model Masterpieces) has been give a renewed life with lots of updates and additions including the instructions, wood ramp & Precision Cut one-piece trusses! And, you will be able to select which style of Doctor Ben's Shingles, Corrugated Metal, or Copper roofing that you would like for this fine model. Stay Tuned for more Updates! The windows, doors, and other details are Grandtline product molded plastic. 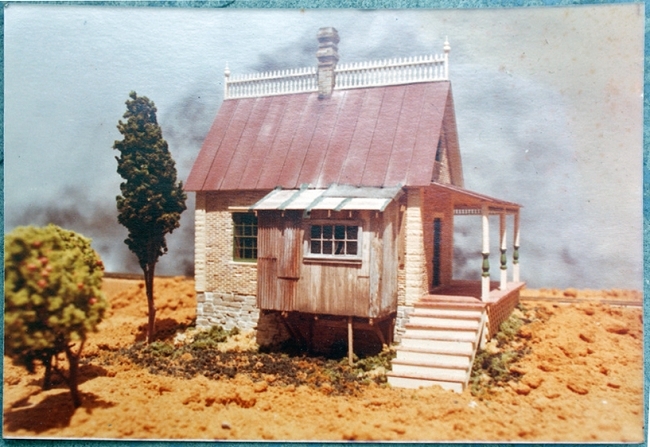 Kit includes full-size drawings (SEE THUMBNAILS BELOW), scale lumber and detailed construction and weathering instructions. And yes, Doctor Ben's Weathering would look good on the roof. Directly below are the Elevation and Isometric Views of this kit. Instructions are full-size sheets and included is a color photograph!